Grease a 8.5 x 4.5 Inch Loaf Pan. 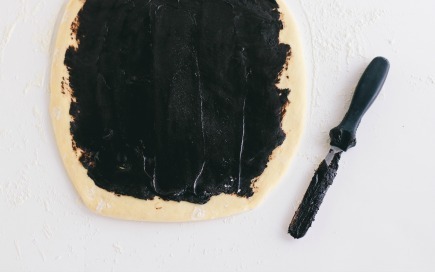 Roll out the dough into a 1/4-inch-thick rectangle. In a small sauce pan, combine the bittersweet chocolate and butter. Heat until they are melted, and then remove from the heat. Add the powdered sugar, cocoa powder, and cardamom (if using). Stir to form a smooth paste (if your chocolate paste is too firm to spread, add another tablespoon of butter and gently heat to loosen). 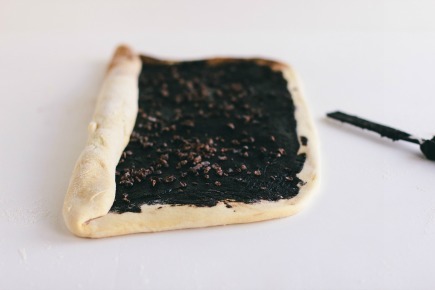 Spread the chocolate paste over the dough, leaving a 3/4 inch border. Sprinkle the cacao nibs evenly over the chocolate. 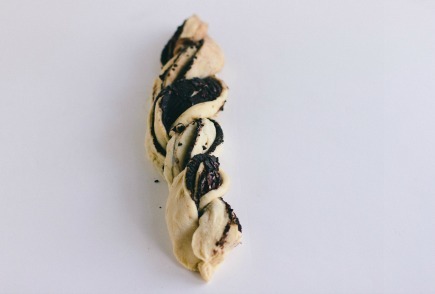 Starting with the long end of the dough, roll the dough into a log. Trim about 3⁄4 inch off both ends of the roll. 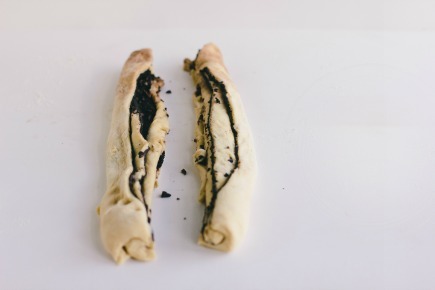 Gently cut the roll into half lengthwise, so the layers of dough and filling are visable. Carefully lift the bread into the prepared loaf pan. Cover the pan plastic wrap and leave to rise in a warm place for 1 to 1 1⁄2 hours. The bread will rise about as high as the loaf pan. Preheat the oven to 350. Bake the bread 35-45 minutes, or until a skewer inserted in the middle comes out clean. While the bread is baking, make the syrup: combine the sugar and water together in a small saucepan over medium, and bring to a boil. When the sugar has dissolved, remove from the heat and set aside to cool. As soon as the bread comes out of the oven, brush the sugar-water all over the top of the bread, using all of it. Let the bread cool a bit, and when it is just warm to the touch, remove from the pan and let finish cooling on a wire rack. Here’s our list of favorite Bread Baking Tools for any of the bread bakers, or soon-to-be bread bakers, on your holiday list! Absolutely stunning! I have done this process before for a ring bread and it is so beautiful but I love the way it looks for a loaf. Gorgeous and I’ll be doing this one! I know isn’t Sarah’s loaf amazing! Where can you find cacao nibs? Looks delicious! Can I replace cacao nibs with chocolate chips? Some grocery stores, like whole foods and Trader Joes may have them, or you can order them online. I’ll put a link to them in the post. I think it is a great idea and it should be lovely! Please let me know how it goes. I will have to make this beautiful loaf. Looks delicious! 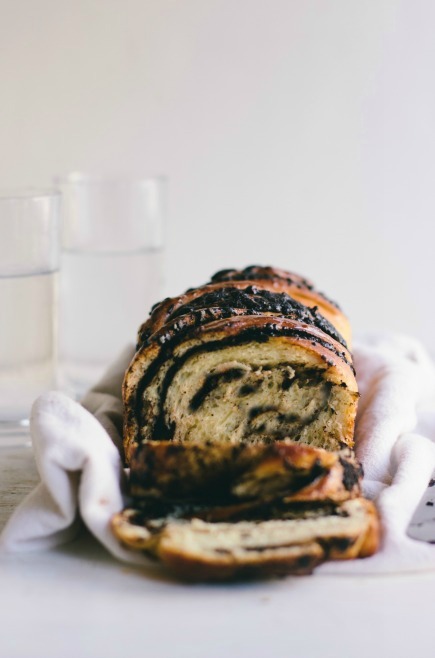 Could I use the Honey Graham Bread recipe to make the Braided Chocolate and Cocoa Nib bread? Hello, is there a specific reason for why a smaller loaf pan (8.5 x 4.5 inch) is used relative to what’s recommended in the AB5 book (9x4x3). Does it make a huge difference? The link in the recipe goes to what appears to be a not-so-standard sized one. Or is the linked loaf pan actually a standard sized, more widely sold one (http://www.amazon.com/USA-Pan-Aluminized-Steel-Americoat/dp/B002UNMZOO/ref=pd_sim_k_1) just measured differently because of the sloping sides? If there is a difference, should we be compensating for the slightly larger pan somehow if we use the 9×5? Thank you! These are the same, it’s really an arbitrary decision by the manufacturer as to where exactly to measure from. No need to compensate. I’d consider the Chicago Metallic to be a standard, but really doesn’t matter. All the pans have sloping sides. 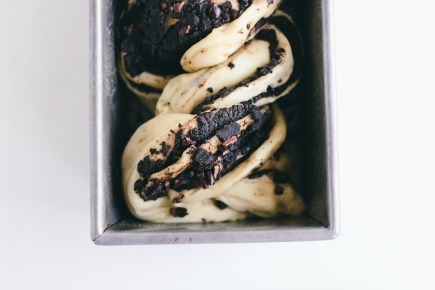 I made this today using the original ABin5 brioche recipe and using 60% cacao bittersweet choc chips instead of cacao nibs. The cardamom works great. 🙂 I found myself half-doubting the instructions to use up all the syrup since it feels like a lot, but the bread managed to soak it up well. I wish I knew how do do it but I’m not very techy. I wanted to try the contest winning cake but ,I wanted to simplify it. I took about 1 1/4 pound of challah dough and rolled it out . I spread Nutella on it and left a borde. From this point on, I followed the recipe with rolling it up, cutting down the center, braiding ,resting baking and brushing with cooled sugar syrup. It was the most delicious thing I’ve eaten and probably more to my liking because it was sweeter. I am having a wonderful time trying all of these new things. Just wanted to share this very simple method. This sounds fantastic! So glad you let us know. I got your book for Christmas and have enjoyed reading through it. It is great to have the measurements in grams as well, as I live in the Netherlands and we don’t use cups at all. I made Challah dough last week and Brioche this week. Both of which were great! 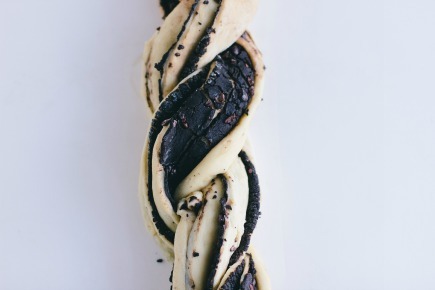 Also made one of these braided chocolate breads with both the challah dough and the brioche dough, and both turned out lovely! Thank you for sharing your knowledge and recipes with the rest of the world, and lots of love from the Netherlands! Thank you so much for the note, we are thrilled that you are baking and enjoying the bread! I made this bread today. It was very pretty and VERY tasty! I really enjoy making these breads. Thank you for the books and updating and answering questions on the blog. Good morning. Do you think that there would be any reason that hamburger buns could not be made from challah dough instead of brioche? Wheat? Pumpernickel bread came out just like the real deal! Yes, the challah makes wonderful hamburger buns! I would love to make this to bring in to my office, but I leave too early to make it the same day. If I made this a day ahead, how do you think that would be the next day and how should I store it overnight? If I wanted to make it to eat the same day, how long would you let it cool? I can’t tell you how much I’ve enjoyed trying out your recipes! The pletzel has been my favourite and brought back some memories of my childhood but my husband thinks the naan is the best, since he gets to have fresh bread in the mornings, in under 10 minutes. We recommend letting the breads cool until they are room temperature, which can take any where from 40 to 90 minutes. You could bake this the night before and serve it the next morning. Or you can shape the loaf, put it in the pan, loosely cover with plastic and refrigerate it overnight. In the morning you can bake it, just let it sit on the counter while the oven preheats. You will need to allow some extra baking time, due to the chilled dough. Thank you! I think I’ll try shaping it the day before and baking it in the morning. I’ll let you know how it goes! I saw this recipe and thought the bread looked so beautiful it was worth attempting in my efforts to get over my fear of baking with yeast! A couple of questions. I used Platinum red star yeast-should there have been any alterations to the instructions? The dough looks more amber in color than normal creamy/off white colored dough I am used to. Also after cutting into the bread it seems heavy and while firm, not “bread” like as in the finished slice picture. A toothpick came out clean and it holds together when sliced….but it does taste doughy and looks heavier than your picture. I am not going to give up and will continue to work with yeast and your wonderful recipes! Any thoughts on my dough and finished bread? No, same with Platinum, which works well in our recipes. Was wondering if you mix the yeast with the water first as the butter would be too hot? How long can we freeze the brioche uncooked? By the way, made this today, kitchen smells amazing! Our book says two weeks, but I typically go longer, a month or more. Many people find that it becomes too dense if you do it my way, so start off conservatively with that. Let it cool and had some, it was amazing. Next easter buns. 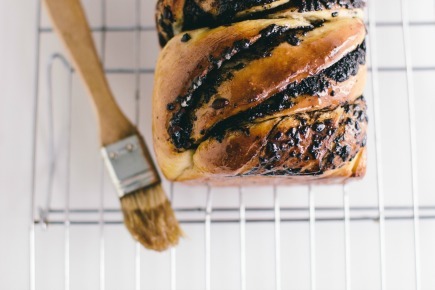 Should cooked brioche be kept in the fridge or pantry and for how long? Just reading “old” Artisan Bread and ask . . Why not give measures by weight, say in grams? 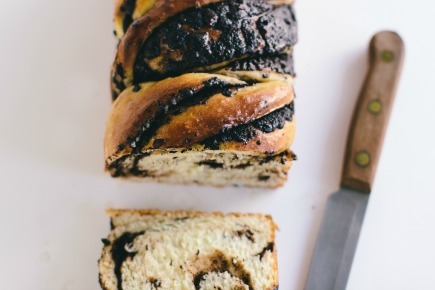 We made the chocolate and cocoa nib brioche and it was fantastic! Planning to make about 10 loaves this weekend for Christmas gifts. However, we won’t be able to deliver them until a week later. Can we freeze the bread after it cools then thaw before gifting? I read the FAQ about storing, but it didn’t mention freezing. Thanks for your help! Yes, freezing would be a perfect way to store these before giving them as gifts. Be sure to wrap them very well.